Though the technology was initially used to make bitcoin transactions secure, today, it has gone far beyond that. Its growing popularity can be understood from the recent studies that have forecasted it to grow to 2.3 billion U.S. dollars by 2021. While banking and finance sector has particularly benefitted from this technology, it’s the advertising and marketing sector that is looking at it as the next big thing to make the bond between brands and customers stronger. Here’s how blockchain application development can revolutionize the world of digital marketing. Two parties, who want to do a transaction, initiate the transaction. 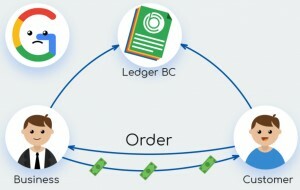 Each transaction is recorded in a block which is sent to the blockchain system’s network of participating computers for verification. The participating computers then evaluate the transactions, based on agreed rule. When a consensus has been reached, the transaction is said to be valid. After the transaction is verified, the block of transaction is time-stamped with a cryptographic hash, which is basically a string of alphabets and numbers. Apart from the new hash, each block also contains link to previous block’s hash, thus creating a ‘chain of blocks’. It is this feature that makes a blockchain so secure. If one has to tamper data in one block, it will have to change information in all the previous blocks, which is nearly impossible. A recent study reveals that up to 7.6 percent of all display ad impressions were fraudulent in 2017. As per White Ops, Advertisers and the fraud detection organization, marketers lost $7.2 billion to digital ad fraud in 2016. According to a study conducted by Marketing Week, U. S. brands lost $6.5 billion to ad frauds in 2017. People feel overwhelmed, annoyed and stalked by bad digital ads. A recent survey has revealed that 79% of people feel like they're being stalked by retargeted ads. Online Ad frauds and annoying ads don’t just cost marketers money; they erode the trust between brands and their consumers. Therefore, something must be done to address this problem. That’s where the blockchain technology steps in. It can provide us that much needed hedge against online frauds and help retain customers’ trust. The online marketing and advertising industry, should be ready for the potential disruption and opportunities that the blockchain technology is about to bring. Many facets of digital marketing could be affected by blockchain technology. Let’s take a look at some of them. Blockchain will possibly have a direct impact on the digital display advertising. In the present system, the advertisers and customers ‘meet’ through a middleman (e.g. Google). Facebook and Google are the two main companies that control digital display ad inventories. With blockchain, they may become totally irrelevant. In fact, it’s already happening with BAT, which is the acronym for Basic Attention Token. It allows advertisers to pay people based on a person’s focused mental engagement required to view an ad. 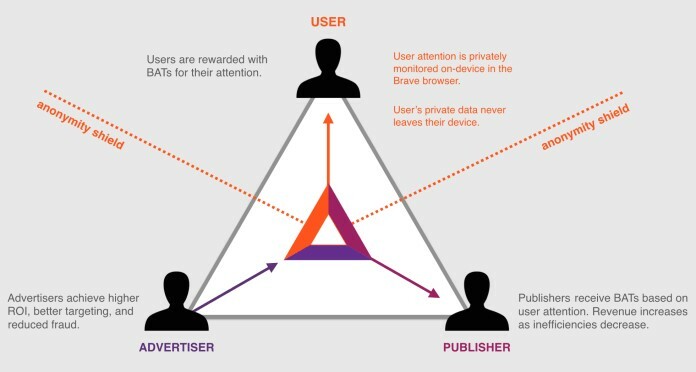 BAT connects the advertisers to their potential customers in a more direct way. Blockchain will allow advertisers to connect directly to their potential customers. Beyond this benefit, the blockchain will even allow the advertisers to confirm whether someone has viewed their advertisement. Blockchain will enable direct business between advertisers, publishers, and their users. The display ads on mobile devices are not just intrusive, but they also drain a device’s battery and waste an incredible amount of mobile data. 64% of people surveyed said that they find display ads annoying or intrusive. 34% of people said that they usually click online ads by accident. Adoption of mobile ad blocking has gone up significantly by 90%. The solution: Marketers need to use unobtrusive forms of advertising. But, how can blockchain technology help with that? Blockchain will provide consumer information to the advertisers while keeping the anonymity of the users intact. Users will get fewer ads, that too only of high quality. The ads will be more specific to what the users are actually interested in. This will lead to a win-win situation for both the consumers and advertisers. The blockchain technology will bring the much needed transparency to the world of online advertising - thanks to the superior visibility and the tamper-proof nature of the blockchain ledger system. Blockchain technology will help ensure that users visiting a site are 100% genuine. This means, the website owners will only be charged for genuine clicks through to their site. Data leaks and users’ privacy is one of the biggest concerns today. Companies can learn almost everything about the customers online. From the things they buy to the sites they visit. Their personal data can easily be bought and sold to advertisers. Blockchain can help solve this problem too. Let’s understand this by using the example of Blockstack. Blockstack, which is built on blockchain technology, ensures your personal data remains with you instead of existing on servers owned by your application. There are several other projects that are being developed by the blockchain developers to provide the same level of safety and security to the users. For example: Skywire. Using blockchain the advertisers will be able to build customer profiles directly from information customers are willing to share. This will help improve targeting, relevance and will ultimately lead to better conversions and revenue. Blockchain in the digital marketing industry definitely seem like the panacea for some of the woes and pervasive issues in the online advertising industry. This suggests, early adoption of blockchain technology in digital marketing could make a significant difference for both brands and consumers. To know more about the revolutionary technology and how it can benefit your business, contact the blockchain experts today! « Why Should You Build A Mobile Wallet App? Harsh Arora is a Content Consultant at Enuke Software, a pioneering Blockchain and Mobile App Development Company and healthcare Development Company in the USA. Harsh is passionate about the start-up ecosystem, Crypto world, entrepreneurship, latest tech innovations, and all that makes this digital world. When He is not writing, He loves to play basketball, cook and go on drives. Prior to this, He was working for a technology marketing company based in Norwalk as a content contributor and crypto advisor.